Horror films have seen a large overhaul in recent years; gone are the days of spooky Gothic castles, blood-sucking suave monsters or armies of the undead, replaced by detailed glimpses of graphic torture, suburban modern settings and endless jump scares. House at the End of the Street might as well be the poster child for these modernized, dull conventions; don't be fooled by the apparent scariness, for the only time I pissed myself in the film was when I couldn't stop laughing. Seeking a fresh start in life after a recent divorce with her husband, Sarah (Elisabeth Shue) and her daughter Elissa (Jennifer Lawrence) move into a large rural house in a quiet neighbourhood, one quite awkwardly positioned near a local abandoned house which was once the site of a terrible murder. Upon discovering that Ryan Jacobson (Max Thieriot), the son of the murdered family, does in fact live alone at the seemingly isolated building, Elissa begins to develop a bond with him despite his poor reputation with the locals, yet soon discovers she has made one of the biggest and most dangerous mistakes of her life. House at the End of the Street is a film that never quite understands what it's trying to do, often lacking in any sort of thrills or scares and completely devoid of any true horror atmosphere. Mostly, the film seems to be a poorly acted teenage drama with some lifeless romance, contrived emotional sequences and a storyline that feels like it was written on the spot and never analyzed again. The narrative is a confused mess of poor explanations and nonsensical outcomes, and despite the film's entertaining climactic sequence of events, it all feels lacking in any sort of spark or atmosphere. The acting across this almighty borefest is beyond dreadful, with the only decent performer being Thieriot who does manage to portray his character with some sort of lingering disturbance and inner sadness, but the character is so flawed and generic that he doesn't have an awful lot to work with. Jennifer Lawrence is lifeless, so much so that you can witness the strain on her acting ability when she attempts to contrive some emotional elements to her drab character. Her mother, played by Elisabeth Shue, is not only a boring and useless character, but also horribly acted; the acting is universally laughable, making a film that's already not scary even worse. Crikey. 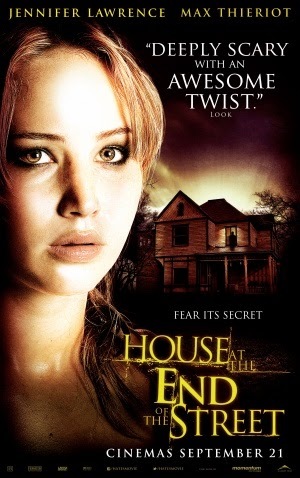 House at the End of the Street squanders nothing with it's premise - because the premise is so bad, generic, dull and uninteresting that it seems it was conceived in a matter of seconds by a team of people wanting to milk the success of recent contemporary horror flicks. It's a boring, confused mess, devoid of what makes a horror film a horror film and trying desperately to develop characters that cannot be taken seriously due to atrocious acting and laughable concepts. All I can say is, I want my money back.